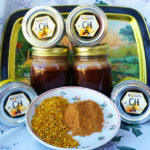 Historical records show us that bee propolis can give us a complete package of health benefit. Historical records show us that bee propolis can give us a complete package of health benefit. Since the age of ancient Egypt until this present time, it has been widely used for various medicinal purposes. Ooooo… he has a real treat to discover! (We did some dettecive work of our own, and found that out of four hives, only one queen survived the winter, so we’ll be having less of that treat ourselves this year!) Have a creative day!